After seeing the photo box that EyeoftheJen made as a wedding gift, it inspired me to try something similar. I have always admired Shipwright’s hinges and thought this would be a good place to give them a try. His SketchUp and excellent tutorial made them about the easiest part of the box-making. I could certainly relate to A1Jim’s box story when I made this attempt. For those of us who aren’t dyed-in-the-wool boxmakers, it can be quite a challenge. With cabinets and furniture, there is at least one side that is never seen and times when only one side is visible but with a box, all six sides will be scrutinized. 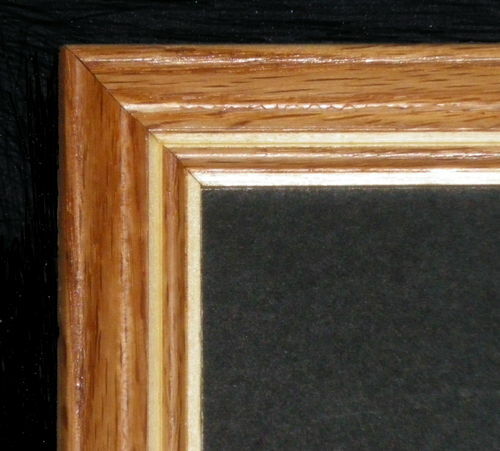 The picture frame inside is glued up from poplar and oak according to the pattern of the router bit. My horizontal router table worked well for this. 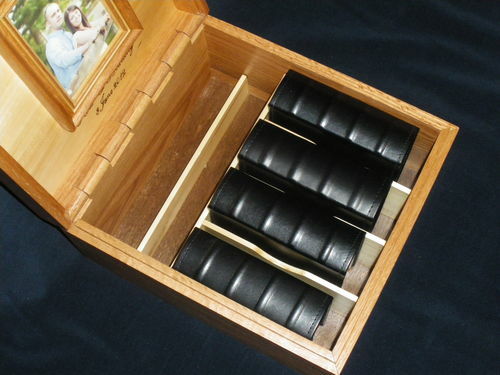 I used rare earth magnets to attach the frame inside the box so the couple can remove the frame and change the photo if they choose. The front dividers hold four 4” x 6” photo albums, each holding 60 photos (if I recall correctly). The back section is intended for wedding cards or other small memorabilia. 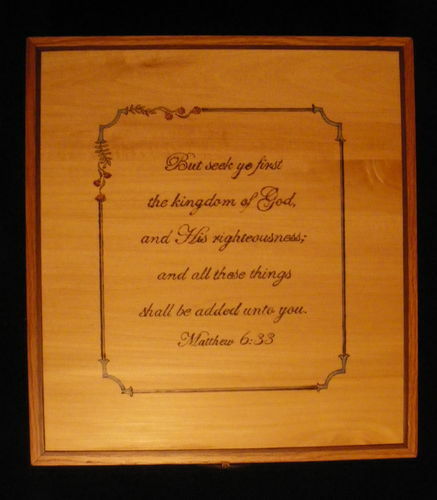 The top is wood-burned and colored with pencils. My concern with using the various woods on the top was that they might split since it wouldn’t work to float the panel with my design idea. It’s been through the four seasons and then some and so far I haven’t heard about any problems with it. The box is approximately 8” high by 13½” deep by 12¼” wide. 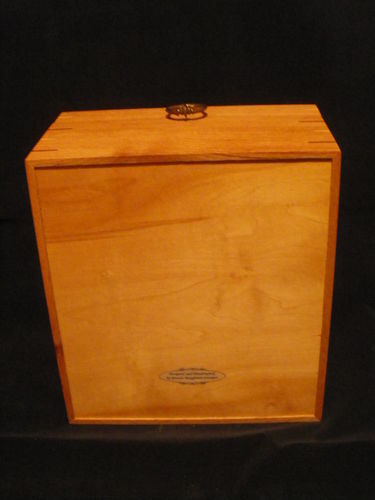 The wood-burned top is made of bass, surrounded by mahogany. The miter keys are mahogany and poplar. The interior dividers are poplar; the bottom is lauan plywood; and the main body is oak. The woods used did tell a story: the bass was milled from the groom’s parents’ property, the mahogany came from his grandparents, and the oak and poplar were cut and milled from our property. The circle pull came from my conglomeration of one-of-a-kind hardware. I included a tag with the box so the recipients would know where the wood originated. I decoupaged a designed and handcrafted by . . . tag onto the bottom of the box. I ended up building a few jigs to try to make things a little more accurate. 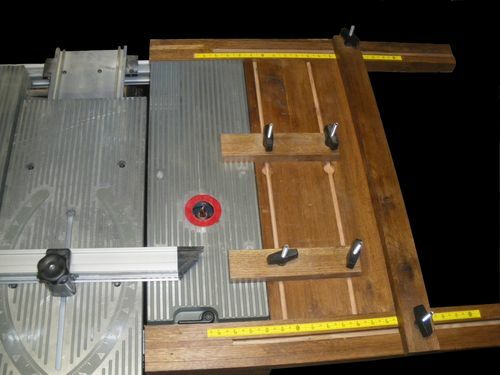 This is one of my favorites that I made to fit the router table section on my old Ryobi 3100 tablesaw. It allows me to cut crosscut and stopped dadoes and flutes more safely and accurately. Love this! and have some weddings coming up this summer. Beautiful box. That is really great wood burning- Looks like laser quality!! Very nice. The jig for the router is sweet, too!! Mighty, mighty fine work! The hidden self cut hinges really set it off as does the internal frame, splines, lid/w the Bible verse. You’ve done yourself proud. You’ve really become of a master and the horizonal router has hepled. God Bless you and have a wonderful Christmas! Karen, I’m glad I could inspire you, too. Isn’t LJs great for ideas?!? Jim, I bought the wood-burning tool for my husband, but he lets me use it! ;-) That jig was really great for keeping the crosscut dadoes straight and true. Russell, Thanks for all the encouraging remarks. Matthew 6:33 is the answer to a good life. Wonderful project exceedingly well executed. Guaranteed to make the married couple happy, and to be treasured for generations. Thanks, Donna, but it could never match up to your carving and painting! Are you still playing your harp? Super box L/W. I feel honoured to have been a tiny inspiration for one small part. I love the story told by the origins of the woods and the fact that LJ has influenced it in several ways. You are one of the stalwarts of the site and it’s nice to be able to comment on your work for a change after reading so many of your insightful comments on the work of others. Great looking box—in all respects. Your wood burning is outstanding; I thought it was laser at first. Fantastic wood burning, when I first saw it I though CNC, nice box, great work. This is one of the most beautiful and imaginative projects I’ve seen. Just love it. From the hinges to the lettering everything is just beautiful. Using magnets for the picture frame is genius, I never would have thought of that. I must try the colored pencils for art work and lettering, I always used sharpie markers. Woods from their family members and your yard makes it even more special. Super job! Paul, You’ve been a great inspiration to many LJs here. We always appreciate your willingness to share your expertise. I did (somewhat) cheat with posting this. I managed to download the project from my laptop using the hot spot at the nursing home where I volunteer the music for their church services for the residents. I just need to make a point of spending extra time there to take advantage of the high-speed connection. John, That’s quite a compliment on the wood-burning. Maybe all the years of calligraphy has paid off a little. Tom, I would love to have a CNC, but I guess I’m too cheap. Thank you for such encouragement! Jeff, Thanks for all the positive remarks. I’ve used Sharpies before but had trouble with bleeding. On the tray table I made for my brother, I put varnish on first and then used Sharpies and sprayed a final finish. That worked okay but I had trouble with the color not being even. With the pencils directly on the wood, I was able to shade and not worry about the color bleeding or coming off with the varnishing. Very nicely done! Love the verse on the top and your woodburning did it justice.